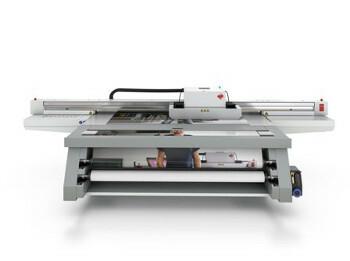 Arizona 480GTCanon has announced it will demonstrate its capability to offer customers a single source for all their wide format solution and service needs at FESPA Digital 2014 (20-23 May 2014, Munich, Germany). The company said that visitors to the stand (Hall B1, Stand 310) will be able to learn about the array of large format printers, software and substrates that represent the full breadth and diversity of Canon's offerings to the market. In an effort to inspire customers to achieve business growth and to highlight how it’s driving innovation in wide format printing, Canon Europe will also be showcasing a variety of customer success stories and applications, including bespoke printed wallpaper and laminated flooring, all enabled by its wide format technologies. Canon customer, Marco de Wert of Sanders Group (www.magnetservice.com) will also be explaining to the Digital Conference Theatre audience (at 15.00-15.30 on (Thursday 22 May) how wide format printing transformed his business. With Océ's expertise and technology now fully integrated into its wide format portfolio, Canon maintains it is better positioned than ever to help Print Service Providers (PSPs) to extend their service offerings and become exceptional service providers. The Canon imagePROGRAF iPF9400, which incorporates LUCIA EX, Canon's innovative 12-colour pigment inkjet system with image processing technology, to deliver high quality results for production, photographic and fine art applications. Duncan Smith, Wide Format Group Director, Canon UK & Ireland, commented: "The wide format market is one sector of the printing industry that is continuing to expand because of the growing number and variety of exciting applications that can be realized on wide format digital printers. Thanks to the unrivalled combination of printing and finishing systems, RIP and workflow software, substrates and services we can offer customers, Canon is ideally positioned as an expert source to satisfy all indoor and outdoor graphic arts wide format demands and to support companies in the long-term growth of their businesses. We want to help our customers to become exceptional service providers, so I'd invite them to come and find inspiration on the Canon stand - they won't be disappointed."